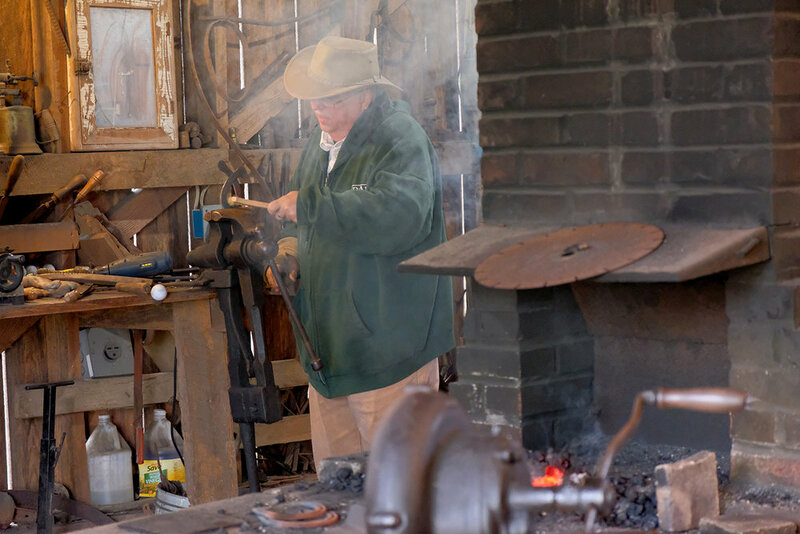 The Blacksmith Shop at the Heritage Homestead is open and fired up each Saturday morning from 9:00 a.m. until Noon, with local members of the Blacksmith Association of Missouri providing demonstrations of the Blacksmith's craft. Hand Forged Items are for sale and custom work can be commissioned. Bring the Kids for a demonstration they won't forget! 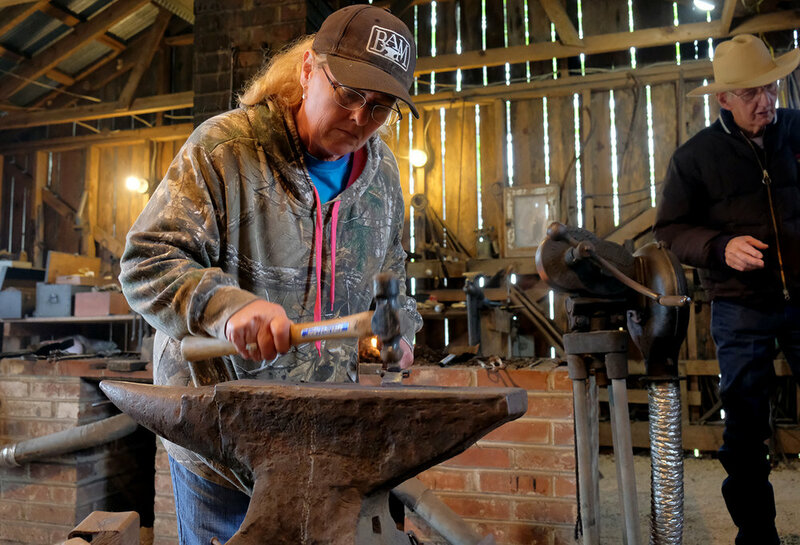 You will find local master craftsmen and women of the Blacksmith Association of Missouri (BAM) forging metal into knives and tools...even dragons and snakes! 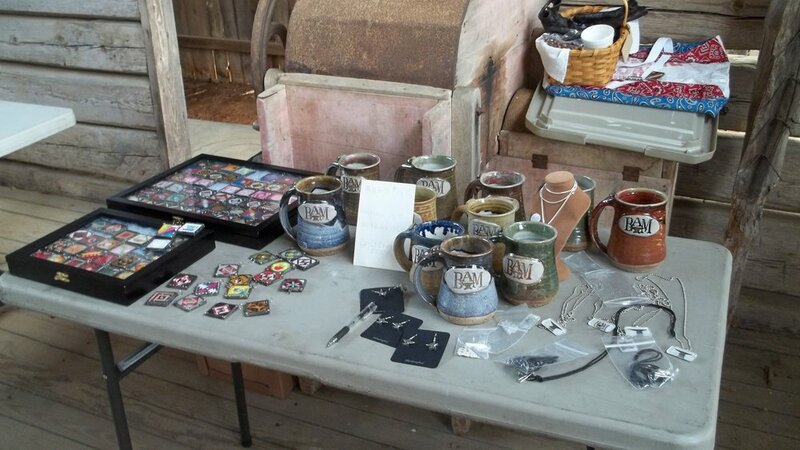 Stop in for a live demonstration, or learn how to join the Blacksmith Association and work on your own projects. 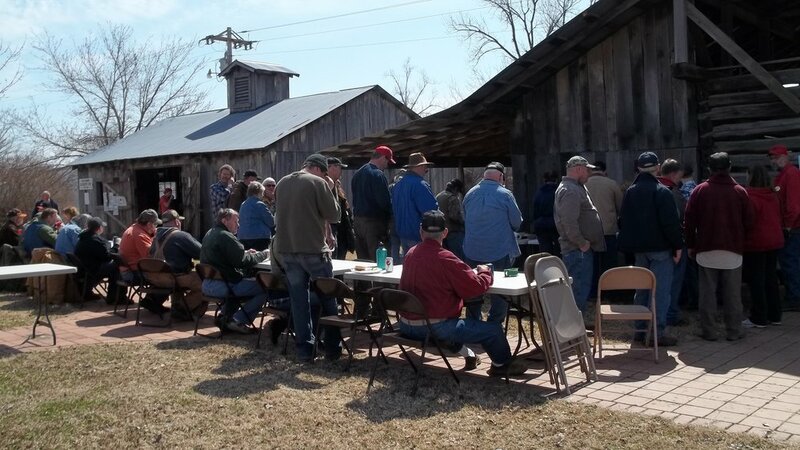 THE BLACKSMITH ASSOCIATION OF MISSOURI (BAM) HELD THEIR STATEWIDE MARCH BI-MONTHLY MEETING AT OUR SHOP ON MARCH 23, 2019. THE MEETING STARTED AROUND 8:00 A.M. FOR THE EARLY BIRDS ASSEMBLED FOR THE OBLIGATORY COFFEE AND DONUTS SERVED IN THE NEWLY RESTORED PLUNK SCHOOL HOUSE BUILDING NEXT TO THE SHOP. THE 3 DEMONSTRATION BY CHRIS MILLER WAS ON HOW TO FORGE AND FABRICATE A WALL BRACKET WITH SUPPORTING SCROLL ON WHICH TO HANG A HANGING FLOWER BASKET; ALSO A DEMO ON THE FORGING OF A THORN TWIST IN 1/2 INCH SQUARE STOCK. LUNCH WAS SERVED AT NOON. BIG D'S BAR-BA-QUE CATERED THE LUNCH AS USUAL. THE FORMAL BUSINESS MEETING STARTED AT AROUND 1:00 P.M. FOLLOWING THE BUSINESS MEETING THE THE IRON IN THE HAT AND TRADE ITEM RAFFLES WERE CONDUCTED. PLANS WERE DISCUSSED FOR THE 35TH ANNUAL OZARK CONFERENCE TO BE HELD MAY 2-5, 2019 AT THE STATE FAIR GROUNDS IN SEDALIA, MO. THE TRADE ITEM WILL BE "SOMETHING RIVETING" (A FORGED ITEM JOINED WITH RIVETS). A short film by Mark Lisk Filmed in the Tom Kennon Blacksmith shop in Doniphan Missouri. WOULD YOU LIKE TO TRY YOUR HAND AT BLACKSMITHING? DNAP’S BLACKSMITH SHOP USER GROUP IS ORGANIZING A BEGINNING BLACKSMITHING CLASS THIS COMING FALL. CLASSES WILL BE IN TWO HALF DAY SESSIONS ON ON A SATURDAY AND SUNDAY MORNING IN OCTOBER, 2019 ON A WEEKEND TO BE DETERMINED LATER. YOU MUST ATTEND BOTH SESSIONS IN THE PROPER ORDER. PARTICIPANTS MUST BE 18 YEARS OLD (OR 14-17 WITH WRITTEN CONSENT OF PARENT/GUARDIAN). EVERY MEMBER OF THE CLASS MUST BRING A SET OF SAFETY GLASSES AND WEAR COTTON CLOTHING. ALL OTHER TOOLS AND METAL STOCK WILL BE PROVIDED. CLASSES WILL BE HELD AT THE TOM KENNON BLACKSMITH SHOP AT THE HERITAGE HOMESTEAD IN DOWNTOWN DONIPHAN, MISSOURI. CLASSES BEGIN AT 9:00 A.M. AND CONCLUDE AROUND 1:00 P.M. EACH DAY. THE TOTAL COST IS $50.00 TO COVER THE COST OF COAL AND METAL STOCK FOR BOTH CLASS SESSIONS. CLASS SIZE IS LIMITED TO THE FIRST FIVE MEMBERS WHO REGISTER AND PAY THEIR FEE. CLASS DATES IN OCTOBER WILL BE DETERMINED SOMETIME IN AUGUST AND POSTED TO THIS SITE. 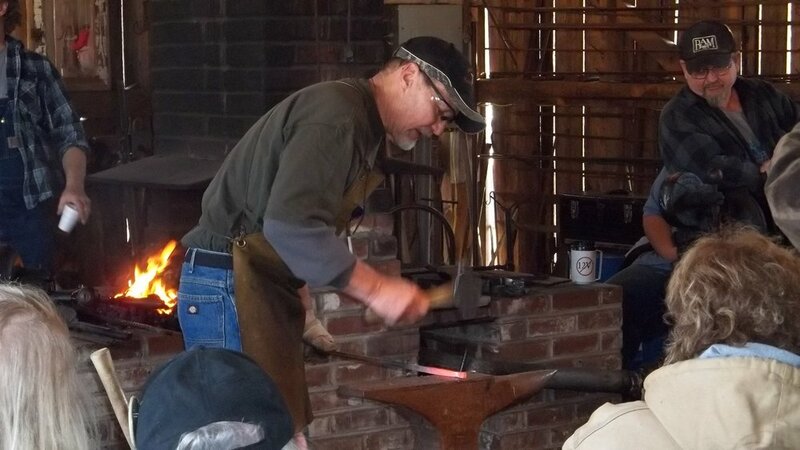 Session 1: History of Blacksmithing, Sources of Information, Introduction to the Forge, Shop Safety, and Operating the Forge, Hammer and Anvil Basics, Drawing Out and making a drive hook. Session 2:. Upsetting, Bending, Shaping, Making a Leaf Hook; Introduction to Forge Welding. WE ARE MOSTLY RECOVERED FROM OUR FLOOD DISASTER. IN EARLY MAY, 2017. THE CURRENT RIVER VALLEY EXPERIENCED AN HISTORIC FLOOD WHEN THE RIVER CRESTED NEARLY 7 FEET ABOVE THE ALL TIME RECORD.